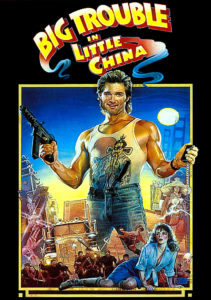 003 – Big Trouble In Little China | All Eighties Movies. All The Time! This week Gidgit Von LaRue and Angryman chat about the 1986 John Carpenter action/comedy/martial arts classic, Big Trouble in Little China! This entry was posted in Podcasts and tagged action, big trouble china, comedy. Bookmark the permalink. So refreshing having a new take on 80’s movie. You both all obviously love these films and you work so well together. Consider me a new fan. Love 80’s films. Thank you for showing such respect to them! You are obviously friends and fans of 80’s films. My new favourite pod cast. Hi Lilly, thanks so much for taking the time to comment. We love the films, and happy enjoying them with you! Much appreciated! Cannot wait to hear more! I listen to a lot of 80’s movies pod casts but you two obviously watched them like me in the 80’s and please keep doing them. Can I suggest The Thing?